I’m told that most Velocity builders start with the wings. Perhaps it’s because building the wings and canard are included in the first construction chapter, or perhaps they think the wings are relatively easy. Whatever the thought, that’s where I’m starting! This is what the wings looks like coming right off of the truck from the factory! Nope, they don’t much look like wings, do they? 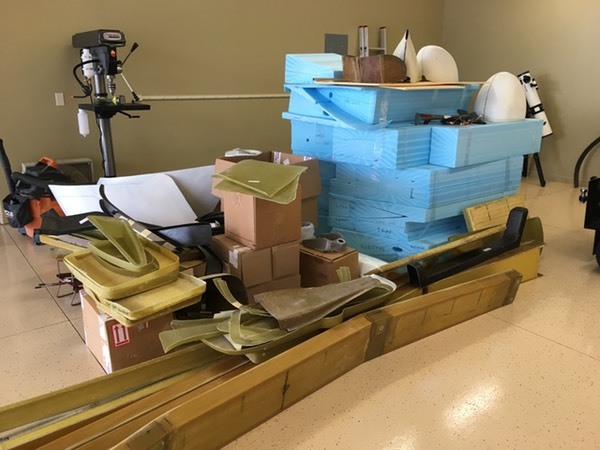 The blue foam material is the actual shaped wing cores that need to be placed properly on the spars, then glued into place with a special epoxy mix. The spars are also pre-made in the factory (they’ve got to be perfect!) and can be seen at the bottom of the photo. All told, it looks like my work is cut out for me! Actual wing construction begins on the next page.